A pair of F-16 Fighting Falcons from the 125th FS of the Oklahoma Air National Guard reportedly collided while in a training exercise somewhere over Moline, Kansas. 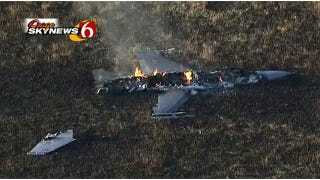 Both pilots are fine but one of the them had to eject and their jet appears to have been destroyed on impact. The other aircraft landed safely back in Tulsa (video here). Not exactly the word I'd use, but that is pretty unusual for a dude just paddle boating in Kansas. One of Oklahoma's block 40 F-16Cs photographed during exercise Sentry Eagle '11.